Take I-290 West. Exit at Harlem Avenue. Turn right (north), and drive 1.5 miles to Chicago Avenue. Turn right (east) on Chicago Avenue. The Home and Studio is 3 blocks east on the right side of the street. Take westbound Green Line L train to the Oak Park stop. Walk under tracks and go north 5 blocks on Oak Park Avenue to Chicago Avenue. Turn left (west) and walk 3 blocks to the Home and Studio. 15-20 minute walk. Trains run approximately every twenty minutes. Board Union Pacific West Line train at Metra Station (Clinton & Madison Streets). Exit at Oak Park stop. Walk north 5 blocks on Marion Street to Chicago Avenue. Turn right and walk one block to the Home and Studio. 15-20 minute walk. Check the train schedule. 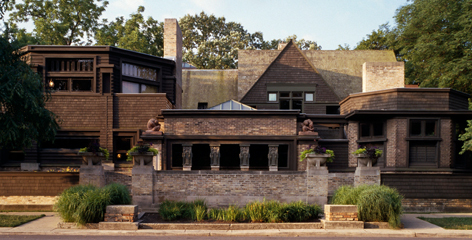 Guests in wheelchairs may request to view the Frank Lloyd Wright Home and Studio DVD, which features rooms that they may not be able to view during their visit. “Will Call” Ticket Holders – Check in and pick up your tickets at the Home and Studio Museum Shop no later than 15 minutes prior to your specified tour or event time. “eTicket” Holders – Bring your eTickets with you and check in at the Home and Studio Museum Shop no later than 15 minutes prior to your specified tour or event time. eTickets must be exchanged for authorized admission tickets before the tour or event.